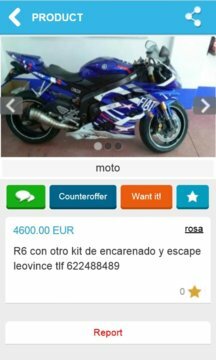 If you are thinking of buying or selling a used motorcycle conanunciosgratis.com can help you. Find the motorcycle that best suits your needs among several thousands of classified ads for motorcycle for sale or post your free ads. 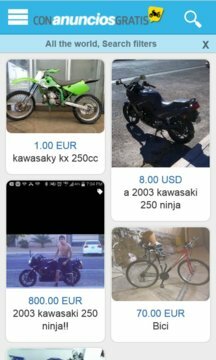 With this app you will find used worldwide, Europe, USA, America, all countries motorcycle. The app is available in several languages. - Post Free Ads including photos you want. - Do a quick search from the home screen. - Use the search engine on the list of results (magnifying glass icon). - See all results passing of an ad to another. - Save your favorite ads. - Search Used motorcycle for sale of all brands (Aprilia, BMW, Derbi, Ducati, Gilera, Harley-Davidson, Honda, Kawasaki, Peugeot, PiaggoVespa, etc.) and types (Scooter, Naked, Trail, Custom, Cross, Enduro, etc). - Filter by region, city, make, model, type, fuel and the type of motorcycle, etc. - Sort by relevance or date. - Contact the seller for more information, to see the quote you used motorcycle or send an offer. - Share listings of cars with your family, friends and others through email, Facebook, Twitter or any other social network. - Use the system of internal chat app to talk directly with the seller immediately and anonymously. - Direct the seller, without intermediaries. - Change the important data for your ads, photos, price or Kilometers. - According to our users, we are the buying and selling app easier, fast and intuitive vehicles.